It may be simple but I am not able to wrap my head around it. I am new to musical tongue. What exactly is an octave? Is it a range of frequencies? And is it specific to an instrument? There are two words that we use to describe how 'high' (or 'low') a musical note is in absolute terms - frequency and pitch. Frequency refers to the measurable number of cycles per second (Hz) in the sound wave, while 'pitch' refers to (subjectively) how low or high the note sounds to us. You would think that the two would be very closely-related. 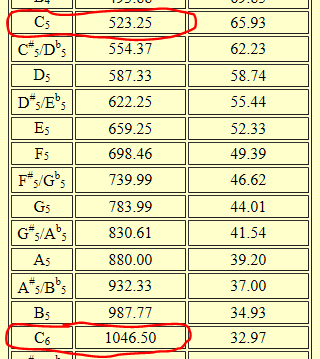 For example, perhaps going up each semitone on the piano might mean an increase of a certain number of Hz each time? Actually, the relationship between pitch and frequency is that each time we multiply the frequency by a certain factor, we end up subjectively increasing the pitch by the same amount. So if we take a note at 100 Hz, and multiply that frequency by 1.5 to give us another note at 150 Hz, the perceived interval (difference in pitch) would be the same as the interval between 500Hz and 750Hz (750 being 500 x 1.5). In general, we can say most people have a strong sense of relative pitch, based on the log of the frequency scale. In our example there, we used a multiplication of 1.5. An octave is simply an interval created by the use of the factor 2 instead - e.g. if we started with our 100Hz note again, and we wanted to go up an octave, we would double the frequency, taking us to 200Hz. If we wanted to go down an octave, we'd halve it, taking us to 50Hz. Why is this factor of 2 so special? The reason is octave equivalence - the way that most people hear something very similar between two notes that are a factor of 2 in frequency apart. In a way, this is unsurprising, as the harmonics that would typically be found in a musical note at, say, 500 Hz (500, 1000, 1500, ....) would be a subset of those found in a note an octave lower (250, 500, 750, 1000, 1250, 1500... so the two notes are stimulating similar bits of our inner ear. This is why, in our system for naming notes, notes an octave apart are given the same letter name - because they have this sense of similarity to them. What exactly is an octave? Is it a range of frequencies? An octave is not a range of frequencies. The musical lexicon does not deal with frequencies. It deals with notes, intervals, scales, keys, chords and other distinctly musical terms. First: Octave literally means a series of Eight, from the Latin octo - eight. The term's musical use reflects that. 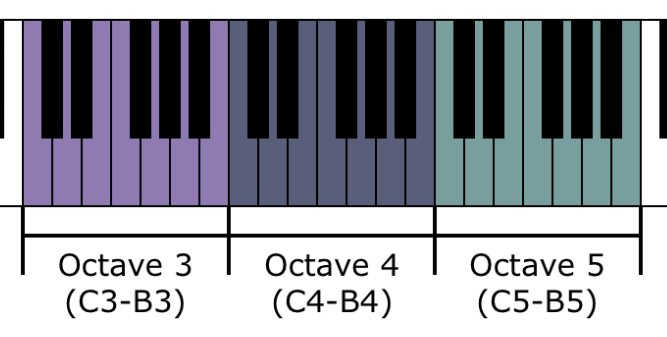 C->D->E->F->G->A->B->C is also an octave. Do-Re-Mi-Fa-Sol-La-Ti-Do is an octave using solfège nomenclature. Relevant to the octave, as well as many other musical terms, it is very important to distinguish between musical terminology and mathematical/scientific terminology which attempts to explain music in scientific terms. They are not the same: The language of music is a language for describing the music we play and hear - a refection of our music, which is hardly scientific. Musical terms may sometimes sound scientific and mathematical, and, like everything else, music has scientific underpinnings which are in some ways manifest in the musical lexicon, but the language of music is not the same as the language of science. Sometimes, an octave is defined as the interval between one musical pitch and another with half or double its frequency. The actual values that delimit a musical octave are determined by the tuning convention being used: An octave is usually not exactly tonic frequency x 2 but hovers around that value - a close enough approximation so that most ears discern octave equivalence [further explained later on] within that range. going to the depths of @topomorto's excellent answer). As @Neil Meyer has explained, in terms of intervals we also have diminished and augmented octaves: A1->A2# is an augmented octave. Here, certainly A2# is not double the frequency of A1. This makes defining an octave as a doubling in frequency very incorrect. When we (approximately) double or halve the frequency of a note, the resulting note sounds exactly the same as the original, just in a lower or higher register. When we play a note @ 440 hz together with a note @ 880hz, they will be perfectly harmonious, to the point that it will be difficult/impossible to distinguish between them, provided they have the same timbre. (Quality/"sound") To demonstrate this, simply play C4 and C5 simultaneously on the piano: Two C's, one octave apart. This phenomenon - our perceived duplication of notes when the frequency is (approximately) doubled is called octave equivalence. Although we have here described how to create the sound of the interval called an octave using frequencies, it is the aural perception, known as octave equivalence, which determines our musical Octave, not the frequencies. One can be entirely ignorant of frequencies, yet hear and understand perfectly the concepts octave and octave equivalence. The Western Musical alphabet is comprised of 7 notes: A-B-C-D-E-F-G After G we start the cycle over, beginning again with A. ( If you know some math, it is akin to a Base 7 number system, where after 7, we start again at 1 (10) ) From these notes we build what we call diatonic scales: An orderly and asymmetrical arrangement of those 7 notes according to a particular pattern, which approximately spans the tonal range of an octave (tonic->tonic*2) such that the 8th note in the scale reverts to note #1, which can be called the last note of the previous octave or the first note of the subsequent one. Keeping in mind the first point we raised, that notes an octave apart are "twins", this makes perfect sense: Since we have reached the same note again, just in a different register (a new 'octave' - be it higher or lower), it gets the same note name as that note in the previous octave. Starting Note (Tonic)->W->H->W->W->H->W->Octave == A->B->C->D->E->F->G->A. With that scale, we've started with the note A, and incrementally increased the frequencies/pitches - represented by musical notes - based on the formula for the Minor Scale, until we reach the point of octave equivalence : (valued @880hz +/- in modern tuning systems) , which we call the Octave, at which point we start all over again. So: When we build a scale that spans an octave in range A1->A2 (440..880), we use 8 notes - all seven notes of the musical alphabet, and then return to the first (or eighth) note to delimit the completed scale - all in all, eight notes: An Octave. When two notes span that range, their interval is called an Octave. And is it specific to an instrument? Further: Dividing the points of octave equivalence across the frequency spectrum into 8 notes is particular to our western musical system. But the concept of our octave as represented by octave equivalence is virtually ubiquitous in all musical systems, because it is dictated by the laws of physics: When we double a frequency, the resulting note is the virtual twin of the original one. Although not all musical systems divide the "octave" - the range of a note to its double - into eight parts - virtually all of them build their music using that mathematical framework: Their musical units are divided into "octaves", although it may be divided into 12,16,20,32 or really any number of notes to form a recurring cycle representing musical divisions, akin to our octave. The concept of the octave - the recurring cycle of notes as we iterate through the sonic spectrum perceived as octave equivalence - need not be described using only our 8 note division. Such differences in how the physical "octave" is delimited highlights what we explained previously: The language of music is not the language of mathematics. In music, an octave is the interval between one musical pitch and another with half or double its frequency. Before we go further, are you pondering this from the perspective of a singer, a guitar player, a piano player, or a horn/woodwind player? It is the note eight scale degrees up or down. It has the same letter name but not necessarily the same pitch. The perfect octave is the same note in a higher (or lower) register but the diminished and augmented octave are both intervals with different letter names. Why the unison and the octave are not called the first or the eight is an interesting, potential follow-up question that I do not have the answer for. Musically an octave is an interval that is 12 half steps above or below a given note. It is the same note with a higher or lower pitch. If you look at a keyboard you will note that there are exactly 12 keys from low C to the next highest C on the keyboard. On a guitar there are exactly twelve frets between each the same notes. Sonically an octave is absolutely based on frequencies. A “concert A” has a frequency of 440Hz and the next A (I.e. the octave) has a frequency of 880Hz and the next octave has a frequency of 1,760Hz. Given the frequency of any note the octave will be double or halve the frequency of the tonic and a pitch that is 12 half steps away from the tonic. An octave in simplistic terms is basically a series of eight. This particular series is dealing with the eight different notes that make up a scale. I’m going to use C major as the example in this situation. So if you were to play the C major scale starting at middle C, you would walk up C-D-E-F-G-A-B-C. That series of eight notes is a singular octave. Now let’s say that you start at the next highest C on a piano and played a scale. That is a separate octave, this can be said for any note that is played on any instrument. There is also another way that an octave is described, and that is mainly to of the same note that are either higher or lower than each other. Using the C once again, your middle C in musical terms is considered C4. When you go up to the next C, it is C5, and that goes on the same for C you go up to. As an added explanation, any note lower that middle C cannot be in the fourth octave or higher. An example of this would be the B directly below middle C, that note is known as a B4. I hope this was a helpful explanation! Not the answer you're looking for? Browse other questions tagged piano octave or ask your own question. Improvising on the piano as a solo instrument: what octave range to cover? How octave is effective in vocal range?